HWB assessment information: one stop shop! 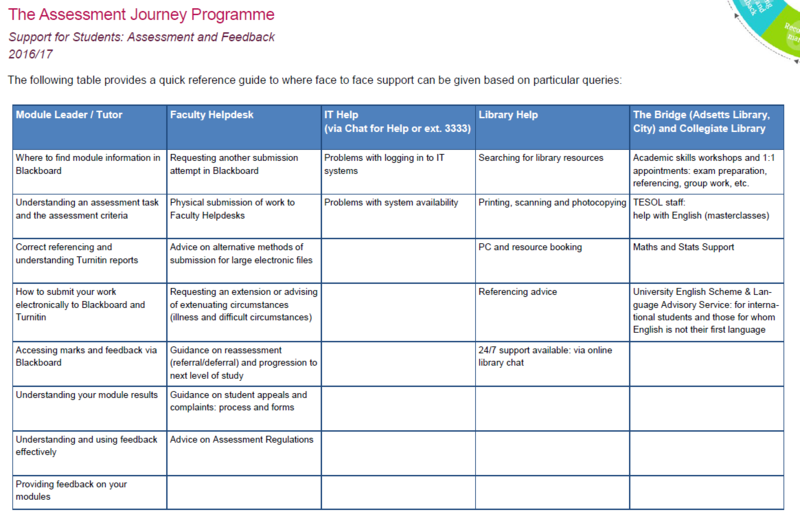 As a team we create a number of resources to support staff with online assessment as well as signpost those created centrally by the University. This, along with the relevant faculty guidelines, leads to a lot of information in a lot of different places. To try and make it easier to find the information or guidance you need, we have created an online resource which you can find by clicking on the link below. The resource has information about faculty policy and recommended practice as well as housing a number of helpful video and written guides. Adobe Spark is a collection of creative tools available for free online that allow you to quickly create professional looking animated videos, scrolling web stories and social media graphics. The three tools available are Spark Video, Spark Page, and Spark Post. You will need to go to https://spark.adobe.com to access the tools and it is reccomended that you use your University Google account to login using the following format for your e-mail: yourusername@my.shu.ac.uk and your usual staff password. Spark Video is helpful for presenting information and quickly stitching together short video clips in an engaging resource. The tool allows you to combine photos, videos and text with a basic theme and background music to create a video that can be shared directly from Spark or uploaded to somewhere like YouTube for wider sharing. You can also download videos to have the file for yourself (note: the free version of the tool will add a slide to the end of your video that says ‘created with Adobe Spark’). Spark page allows you to create a webpage displaying images, videos and text in a variety of layouts that visitors can navigate through at their own speed. Click here to visit an example Spark Page about walking in the Himalayas. More information and help can be found at https://spark.adobe.com/ and please get in touch with the TEL team if you would like support with using any of the above in your teaching. A guide is available in My Grades which will advise students on how to access their feedback. The screenshot below highlights where students can access this video. However, if you make changes to a grade using Manual Override in Grade Centre this can affect the way feedback is displayed to students or hide it from view altogether. In some instances Manual override can be entered inadvertently (see Manual Override via Crocodoc below) and it is advised that Edit Grade is used as the preferred option. Using Edit Grade is suitable for moderation as it will still keep a record of all past grades and feedback in the Grade History. A manual override grade is entered in Crocodoc by clicking on the pencil icon and entering a grade in the black area circled in red below. Grades should not normally be entered here but in the attempt box in the blue area below, circled in green. …and the orange triangle shown below in Grade Centre. When feedback has been provided through Crocodoc and an override grade is provided this will have the effect of hiding the blue speech bubble (image) that normally indicates feedback has been provided to students in My Grades. If this is the case, students can still access their feedback but they will need to click on the title of the assignment in My Grades to be taken their feedback. Manual override grades can also be entered from ‘View Grade Details’ menu accessed from the Grade Centre. This will have the same effect as described above, however if new feedback is provided in the Manual Override area this will appear as a speech bubble in My Grades. Manual override from a Standard Column (offline submissions). A Manual Override can only be completed in a Standard Column by going to ‘View Grade Details’. As with above; it is recommended to choose Edit Grade instead of Manual Override. If you have entered a Manual Override grade it is important to re attach feedback in the Manual Override area as any previous feedback will no longer be available to students. Smart views are a neat and tidy way to view specific students, instead of all enrolled students, in grade centre. The tool allows you to collect a number of students whether it is a tutor group or a marking group into its own unique area within the Grade Centre. This allows quick access to these groups submissions, grades and can save you a lot of time when it comes to marking and giving feedback. Note: There is currently an issue with Smart Views that means when you cycle through submissions using the arrows at teh top, or by pressing submit/save draft, you will be taken to the next student in the full cohort rather than the next in the Smart View. To avoid this when marking or providing feedback through Crocodoc it is necessary to open each student’s submission individually, directly from the Grade Centre. The University has identified a set of standards that each Blackboard module site must meet. It is important that these requirements are adhered to to ensure a consistent student experience. This is particularly true with relation to assessment where submission points need to be set up correctly and in good time with appropriate instructions included. The TEL team can assist with all aspects of setting up submission points through direct support and providing you with the relevant guides and resources. Visit the ‘About us’ page for contact details. The TEL team have created an exemplar module site based around threshold standards which includes examples from across the faculty. It will appear in your list of organisation sites with the name HWB Example Module Site (2015/6), you do not already have access, please contact the TEL team to be added to the site. The site includes information and guidance as well as exemplar content that you can view and copy and paste to your own site, editing where appropriate. There is also a faculty specific website available, based on a resource developed by the Development and Society TEL team, which clearly outlines the Threshold Standards and how to meet them. Click on the image below to access the website. This post is a guide to all of the options available when creating a standard Blackboard submission point. Rather than go through the process step by step, I have instead listed all of the options that you will see when you go to create a Blackboard or Turnitin submission point and explained the purpose and function of each one. Name and colour: Here you can give a name to the submission point. The name should give a clear indication of which assignment should be submitted and also signal to students that they must submit here and to the Turnitin submission point. The colour simply affects the colour of the text for the assignment title. Instructions: Here is where you can write instructions for students on submission. This should include information such as the word count, reccommended file types and the due date. A template for these instructions, which you are free to copy and paste, is available on the HWB TEL example module site. If you are not already enrolled on this site please e-mail us at ! HWB TEL and ask to be enrolled. Assignment files: This button allows you to attach files to the submission point such as the marking/assessment criteria. Due dates: A due date does not restrict the availability of a submission point, or a student’s ability to submit. Any submissions made after the due date will still appear in Grade Centre but will be categorised as a late submission and students will be notified of this. A due date it will be visible to students when they open the submission point but you should also include this in the instructions. Grading: Here you can enter the points possible in the assignment. It is important to put the correct number in here in order that the Grade Centre column attached to the submission point is configured correctly. In most cases the number will be 100. You can also attach a feedback rubric at this point. For more information on feedback rubrics click here. -Submission details: Here you can choose whether the assignment is an individual or group assignments (this setting defaults to individual). you can also choose the number of attempts and which attempt is marked. The default setting is multiple attempts restricted to 2 attempts with the latest attempt being graded, these are the recommended settings for . –Display of grades options: The primary display is the form in which the grade will be typed into Grade Centre and will display to students in My Grades. The secondary grade will only display in Grade Centre next to the primary display. Selecting ‘Include in Grade Centre grading calculations’ means that the grades for this assignment will be included in a total column in Grade Centre and can contribute to a weighted column. If ‘Show to students in My Grades’ is selected, students will be able to see any grades entered for this assignment in My Grades. This option can also be controlled using the ‘Hide from students on/off’ option in Grade Centre. selecting ‘Show Statistics to students’ will allows students to see the average score for the cohort on that particular assignment. Availability: Selecting ‘Make the assignment available’ allows students to see the submission point. Any restrictions subsequently placed on availability dates or via adaptive release will take precedence over this so it should be left ticked if these are being used. The availability dates determine when students can see and use the submission point. If ‘Display After’ is left blank the submission point will become immediately available, provided ‘Make the Assignment Available’ is ticked. Selecting ‘Track number of views’ turns on statistics tracking for the assignment so a report can be generated on the number of times it was accessed although the tool’s accuracy has not been formally assessed. Click ‘Submit’ when you have finished to create the submission point. When viewing the options below in Turnitin, each setting has a blue question mark next to the title which will provide information in addition to the below about that particular setting. Hover over the question mark to view the information. Select your assignment type: Paper Assignment is the default option and the one that should be used for a summative submission alongside the Blackboard submission point. A Revision Assignment should be used when you would like students to be able to submit multiple drafts and compare the submissions against each other. Assignment title: Here you should type a title that makes it clear which assignment should be submitted here and that this is the Turnitin submission point. Start date and Due date: These function similarly to availability dates for a Blackboard submission point, determining when the link is available to students. You can choose to leave the submission point open for late submissions in the optional settings. Allow only file types that Turnitin can check for originality/Allow any file type: This setting will default to the first option and it should be left this way to avoid any submissions failing to generate a report. Optional settings: Click on this heading to view the additional settings for the submission point. Enter special instructions: Here you should type in instructions that signpost the Blackboard submission point above and briefly indicate what the submission point is for. Students should also be made aware that it is compulsory to submit here AND to the Assignment submission point. Exemplar instructions are available on the HWB example module site. Allow submissions after the due date: This setting will default to no and this is the recommended option. Generate originality reports for submissions: This will default to yes and should be left this way as this is the reason for using Turnitin at SHU. The keyword/phrase should appear on a line on its own. note: if you choose no (the default option) you can still choose to individually view the reports with the bibliography excluded at a later date. Exclude quoted materials from Similarity Index for all papers in this assignment: It is recommended that you leave this option set to no. Reveal grades to studnets only on post date: You can leave this option as the default ‘no’ as grades should not be provided to students via the Turnitin submission. If you do find that you need to provide a grade for this submission, you will still be able to do so and release it via Grade Centre. Submit papers to: ‘Standard paper repository’ this option should be used for summative submissions and means the work will be added to the pool of work submitted to Sheffield Hallam that Turnitin will check for matches in the future. ‘No repository’ can be used if you want to check/allow students to check the originality of the work without adding it to this pool. Search options: This determines which repositories of work the submission will be checked against. It is recommended to leave this as the default with all options selected. …Save these options as your defaults for future assignments? : As most of the recommended settings are the default you can leave this box un-ticked. The below information is from the central TEL team and includes important details relating to an issue with Blackboard than can lead to a students’ submission appearing to be blank. The issue only occurs under certain circumstances when using the Microsoft Edge browser which is the default Microsoft internet browser on Windows 10. The full details are below. From September, the way staff and students access software at Sheffield Hallam is . To find some applications, you will need to use the new Sheffield Hallam AppHub. This will be accessible from a shortcut on the PC Managed desktop. Not all software will be in the AppHub – some will be installed in the traditional way and available from the start menu. Click here for more information and a full introduction to AppHub. Below is a video showing how to use AppHub. It’s the time of year when assessments start to come thick and fast. It’s key to get organised and ready for this assessment period with the university wide move to online assessment. Making sure certain things are correct and knowing where to get help will make everything run smoothly. Consider these three aspects of your online assessment. Is your submission point set up correctly? Is your submission point set to unlimited attempts? Does your submission point close at deadline? Make sure the grade centre column is not visible to students. Are you aware who is managing extensions for your module? Do you tell your students this is a ‘submission point’? Do you sign post your students to submit to turnitin and vice versa? Do you let your students know file size limit and what types are available? The TEL team have created an example module site which includes an example of a submission point with the correct settings and the type of instructions that should be provided for students. If you are not yet enrolled on the HWB example module site, please get in touch with! HWB TEL. Please Note: you must be logged into shuspace to access the example site links. Are you ready for marking and feedback? Do you know what marking tools are available? Do you understand the 3 week turnaround? Do you know how to hide/release grade centre columns to students? For information on what marking tools and feedback methods are available visit Assessment Essentials and for help on managing your grade centre or any other TEL related queries email! HWB TEL. The University has recently launched a tool to help staff manage assessment online. The tool enables the bulk download of student work and the upload of feedback file attachments and marks generated electronically outside of Blackboard into Grade Centre for an assignment submitted online. The tool is of use to staff who wish to mark work offline and away from Blackboard, particularly those who are marking a large number of submissions. Using the tool involves a 6 stage process outlined below and covered in detail in these instructions. There are also two screencasts below which demonstrate the process in two parts.